MRT Hood Struts for 1994-2011 Ford Mustangs. These aftermarket Mustang hood struts eliminate the factory hood prop rod and give you the clean, pleasing appearance every engine compartment deserves. MRT Hood Struts are great for both show and street Mustangs - don't let that hood prop distract from all the power you've packed under the hood. These are designed to fit function with the OE weighted hood. 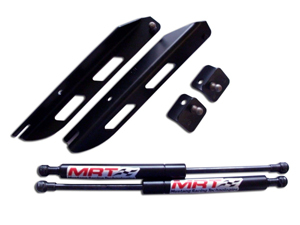 All MRT hood strut brackets are finished in black or silver powdercoat, and new faux Carbon Fiber finish.